Since 1991, the American Saddlebred Horse Association has awarded several scholarships each year to young people involved with the Saddlebred industry as a means to fulfill one of ASHA’s principal missions – the education and encouragement of youths. These scholarships are presented to individuals who are members of the ASHA, have completed the 11th grade and are under 21 years of age. Considerations are also based on who best meet the qualifications of financial need, commitment to the American Saddlebred horse and ASHA youth programs and academic success. While many recipients of this scholarship may plan to pursue a career within the horse industry, this is not a prerequisite for application. Rather, applicants are simply rewarded and recognized for the favorable light they have cast upon the Saddlebred breed – within the show ring, their schools and communities. This year, five ASHA Scholarships of $5,000 each will be awarded. With the 2005 awards, the total amount of money awarded to date in ASHA Scholarships will exceed $200,000 to more than 80 ASHA junior members in more than 20 states. Alexandra Layos, the 18-year-old daughter of Dale and Patricia Layos, has been riding and showing Saddlebreds and Morgans for almost her entire life, from leadline all the way up through junior equitation, and 17 & under classes. After losing her own horse when she was 13, she has spent her years riding and learning from whatever horse was available for her to ride and show. Layos has been an active member of ASHA for 10 years, and she is a member of five other horse associations. She has participated in the American Saddlebred International Youth Program (ASIYP), the youth club Top Hats and Derbies, and the 4-H. During the summer months, she spends much of her time helping out at her show stable, working with horses and teaching the younger kids about riding and horse care. Of all Layos’ equestrian accomplishments, perhaps the most impressive is that she has promoted Saddle Seat riding through writing for a Saddlebred publication as a junior editor since the age of nine. Over the years since, she has scored significant interviews with some of the most prominent figures in the horse community. Besides her magazine articles, she has also published three books about Saddlebreds and Saddle Seat riding, two of which are the beginning of a series called Blue Ribbon Days, and the third of which is a children’s picture book called An Almost True Horse Tale. Alexandra has also had three horse stories published. Outside of the show ring, Alexandra graduated from Allentown Central Catholic High School where she received numerous academic honors. In addition, she was the editor of her school newspaper and yearbook, as well as a member in the school chorus. Layos intends on enrolling at William Woods University this fall. Anne Britton Gentry, or Britt as she is known by her family and friends, began riding in 1996. She has since had some remarkable opportunities that have led to her passion for the American Saddlebred and Hackney pony industries. Her family owns Gentry Crest Farms where they train most of their own horses as amateurs. Gentry has also worked for several other professional training facilities, and has volunteered during summer camp at a horse farm for two summers. Last year, Gentry trained and showed K & J’s The Harley Sportster to Reserve World’s Champion Roadster Pony Under Saddle. At Pendleton High School, Gentry is enrolled in honors and advanced placement courses, and is also a member of the Beta Club. She has played for her high school basketball team and been a member of her school’s swim team. She has also assisted the board of directors for the J. D. Massey Classic Horse Show, and she was elected to manage the 2005 exhibitors’ party. It is Gentry’s aspiration to become a professional horse trainer. She plans to attend Clemson University and major in equine business. She was offered positions in several stables, but she has accepted the proposal from Steve and Julia Joyce, owners and trainers of Cameo Stables. Growing up on a horse farm with show horses and Thoroughbreds, Brooke Schafer learned early to take responsibility for what she wanted to do. The competitive world taught her that if she worked hard and honed her skills, she could succeed and win. She has applied the dedication and responsibility that the horse world has taught her to her schoolwork and community life. Schafer’s mother grew up working with American Saddlebreds. The animated gaits of these horses captured Schafer’s attention at an early age. Previously, Schafer helped and worked for Nelson Green. Two years ago, she was asked by Martin Teater to show a gaited gelding at the World’s Championship Horse Show, which was a dream shared by she and her mother. She currently works part-time for Steve and Tiffany Wheeler’s Autumn Hills Farm. When they must go out of town, the Wheelers entrust the management of their farm in the capable hands of Schafer, which speaks volumes about the maturity and reliability of this young lady. As a student at West Jessamine High School, Schafer always pushed herself to succeed in accelerated programs and advanced placement courses. She has volunteered for a wide range of no-profit community organizations, which evidences her fulfillment in doing for others less fortunate. She has participated in several youth leadership programs. Schafer’s interest in artwork prompted her to compete in the ASHA Youth Art Competition and her sketch of a fine harness horse won the national competition in her age division. Schafer looks forward to attending the University of Kentucky in the fall to pursue her intention of becoming a veterinarian. For as long as Heather Manring can remember, all she could think about was the next time she would be able to ride her American Saddlebred, Be Special. She has been an active member in 4-H at the club, county, state and national levels. She credits her 4-H involvement with her public speaking and communication skills, self-confidence and leadership abilities. This past year has been a challenge for Manring. She developed a life-threatening illness, which prevented her from participating in her favorite sport for two months. This was hard to accept since it was her last year in the junior exhibitor ranks with her equitation horse. Through this rough time, she continued to work hard and complete her challenging academic schedule and graduated valedictorian of her high school class. She also worked very hard to return to riding. She ended up having a very successful show season and was able to fulfill her dream of showing at the World’s Championship Horse Show. Heather recently started and organized an ASHA Youth Club called Rock-n-Riders. As a club advisor, she works with members on ASHA badges, Saddle Time (Heather herself just completed the final level), ASIYP and Academy activities. Although she is currently studying at Otterbein College and working towards achieving her lifelong goal of becoming a pediatrician, she still spends a great deal of time with her horses. 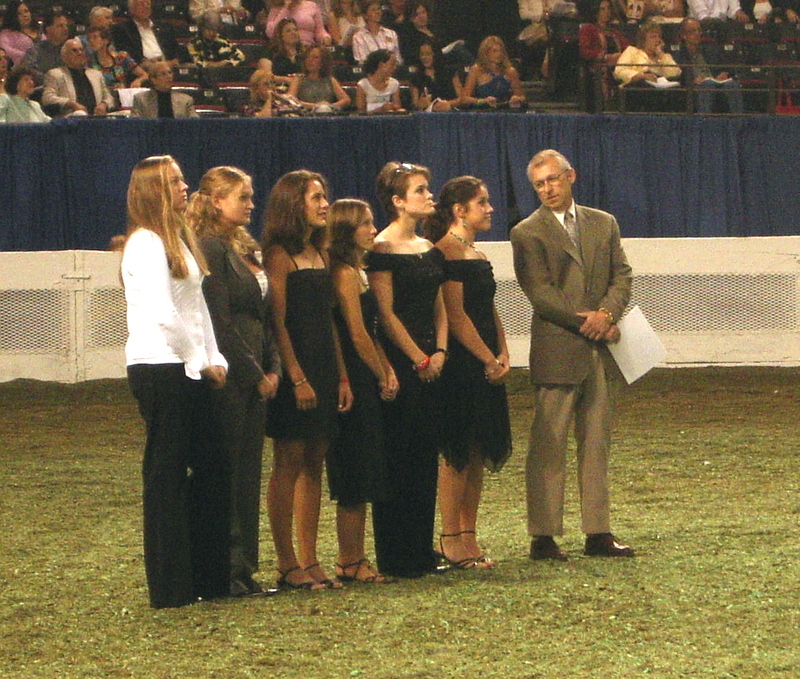 The ASHA Youth-to-Youth Scholarship is an award given annually to an individual who has participated in ASHA Youth Activities, including Youth Conference, Youth Clubs, Saddle Time, Academy Awards, Junior Judging, ASHA Driving Challenge, American Saddlebred International Youth Program (ASIYP) Levels, ASIYP Letters and ASIYP Competitions. Recipients have shown initiative in broadening their knowledge of horses beyond the confines of the show ring and exhibited a commitment to well-rounded horsemanship. They are considered role models for the younger members of their barns, youth clubs, and schools. Funding for the Youth-to-Youth Scholarship is based on donations from individuals and youth clubs. These are frequently the result of fundraising activities at horse shows and youth club meetings. The Youth-to-Youth Scholarship provides a unique opportunity for Saddlebred youth clubs to provide support for other individuals much like themselves. Kristen Jurkynas has been riding American Saddlebreds for the past eleven years. She has been an active member and leader of her youth club, the WoodWind Farm Showstoppers, since 1995. They not only learn more about horses, but they also participate in community service projects. Jurkynas has competed in pleasure equitation, triple qualifying for the equitation finals and even becoming a bronze medalist in the 2004 Pleasure Equitation Olympics. She also participates in Junior Judging when it is offered because she feels it is important to learn more about the breed and discipline by hearing it directly from the judges. For the past three years, she has been working as a riding instructor at Wood-Wind Farm, sharing her knowledge of the breed with many of the students from her community. She loves knowing she has helped others get involved and fall in love with the Saddlebred just as her instructors did for her. Once a week, Kristen works for an organization that offers horseback riding and rehabilitation to disabled children. This experience has introduced her to many amazing children, whose courage and positive outlooks on life have taught her to truly appreciate what she has. At Crystal Lake South High School, she is an honor roll student and a member of the Key Club, National Honor Society, Gator Pride Leadership Group and she also serves as a mentor to members of the freshman class. She plans to attend Purdue University in the fall. Each year the American Saddlebred Horse Association of Alabama, Inc., provides donations for a scholarship to be given to an ASHA junior member from Alabama. In 2005, this scholarship totals $2,500. This program was established in 1996 in an effort to highlight the many benefits that close involvement with the American Saddlebred can have upon a young adult. It is an attempt to promote youth involvement with Saddlebreds and to reward those individuals who have successfully promoted it within their communities. Emily Schwebke is one of the lucky people who can say, at an early age, they found their true passion in terms of both a career and a hobby – law and American Saddlebreds. The daughter of Ronald and Jane Schwebke is a determined and dedicated young lady. Ever since she took an eighth grade elective on law and debate, she has known that it is something for which she has a talent. Yet, it was in high school that this interest really took hold in a history class. From then on, everything having to do with politics and current issues fascinated her, and she found a love for debate. However, she is most invested in the one thing that puts a feeling of excitement in the bottom of her stomach: horses. Nothing has made more of an impact on Schwebke’s life as the American Saddlebred. Whether it means being a camp counselor at the barn, helping to organize local winter tournaments or even providing a comforting word to a beginner after a discouraging ride, she wants to share her passion for and dedication to the sport. She has served in leaderships positions with Heathermoor Blues Youth Club. She is also a member of the Alabama Youth Group, and won the Alabama Outstanding Youth Award in 2001. At Indian Spring School, Emily is a writing and chemistry tutor, a writer for the school newspaper, a member of several clubs and choirs.